Officer Lawrence Dorsey was shot and killed while responding to a man with a gun call at 380 Eastern Avenue, NE. When he arrived he discovered a man with a shotgun. He ordered the man to drop the gun and as he attempted to arrest him a struggle ensued. The man fired the shotgun twice, striking Officer Dorsey both times. 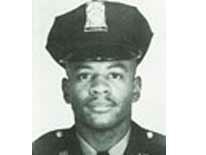 Officer Dorsey succumbed to his wounds five days later. Officer Dorsey had been with the Metropolitan Police Department for five years. He was survived by his wife and two sons. Rest in peace Officer Dorsey.